Tony Rogers sadly died on 16 March 2015, after a short illness. Chris Watson reflects on his friendship with Tony and his partner Dee. I first met Tony Rogers en route to Shetland in 2007. Brother Tony and I collected him from Dee at Southwaite services and headed for the boat in Aberdeen. By the time we arrived there, we knew pretty much everything about him: his early life in Bury and the subsequent move to Southampton with IBM; his two children, Zoe and Alex, and his numerous grandchildren; his love for Southampton FC; his early retirement and the move to Grasmere with his new partner Dee in the early 1990s. As his friends Bob Allen and Lionel Bidwell confirmed at a celebration of his life in Grasmere, you were lucky to get a word in edgeways on a day out with Tony. We spent a lot of time with Tony during that week and discovered how focused he was on bagging Marilyns. He had had a heart problem a year or so earlier, his 'collapse in Keswick car park' as he liked to describe it, and, on his recovery, he determined to approach the bagging of Marilyns with almost military precision. The success of his approach can be judged from his average of 100 bagged each year from his HoF entry in late 2006 to his effective retirement in mid 2014. Tony was always happy to guide people up the Lakeland fells that he loved so well and once he discovered that neither of us had climbed The Howitzer on Helm Crag, he offered his services. This led me to a number of February visits to Grasmere. On the first occasion, he rang me before I had even left home to tell me it was snowing but to come anyway - we would find something to do. This was typical of the man; he could not do enough for you. We eventually succeeded on Helm Crag in 2013 and the following year we settled for an easy Dewey in west Lakeland. Disaster struck when Tony slipped into Hope Beck and was washed downstream. I managed to keep up with him and eventually helped him out. As we made a quick return to Grasmere to get him warmed up, his main concern was that I had not been able to bag any hills that day. Little did we think that this was only delaying his passing by a year. Tony and Dee were regular attendees at the AGM weekend and other trips organised by RHB members. It was in August 2014 that he told me that he had a severe stomach problem. 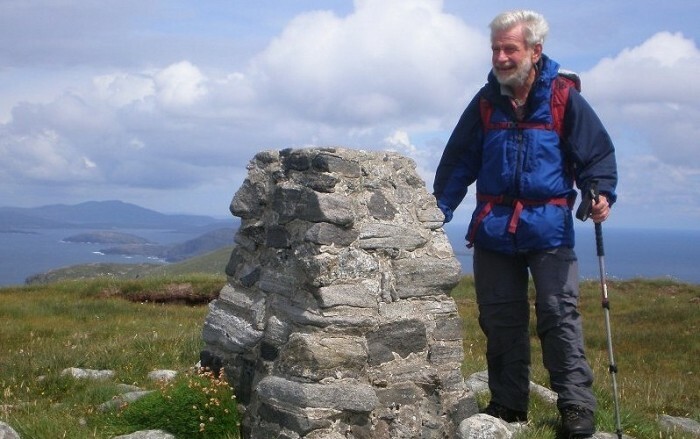 Shortly afterwards, he and Dee told me that they would not be able to join me on my last Munro, Ben Lomond, as he had been diagnosed with an inoperable cancer. Despite this awful news, they found time to order a beautiful engraved glass tankard to be presented to me at the celebration dinner. I visited Grasmere in November to show them the completion photographs and accompanied them on Tony's last ascent of Silver Howe above Grasmere. I found that Tony was facing his final struggle with great stoicism and was intent on making the most of the time that he had left. He continued to get out for a short walk most days, often with Lionel, the last one being a few days before he died. Together with Phil and Kathy Cooper, I was able to visit him on the Wednesday before he died. Sad as the occasion was, we were delighted to hear that he had been well enough to get to Kendal Registry Office on the previous Monday to marry Dee. About a dozen Hoffers attended a celebration of Tony's life in Grasmere on 26 March and it was great to see the esteem in which he was held by the Grasmere community, which turned out in force to support Dee and Tony's family. I have lost a good friend and the RHB community has lost one of its most valued members. Our condolences go to Dee, Alex, Zoe and the rest of the family at this sad time.